The Catskill Creek at Mawignack Preserve. TOWN OF CATSKILL (GREENE COUNTY)—Scenic Hudson and Greene Land Trust will host a public celebration for the opening of the Mawignack (pronounced ma-wig-nack) Preserve in the Town of Catskill, on Saturday, May 12, at 10 a.m. Following brief remarks and a ribbon cutting, visitors will be invited to take a hike on the new one-mile loop trail with birder and naturalist Rich Guthrie. 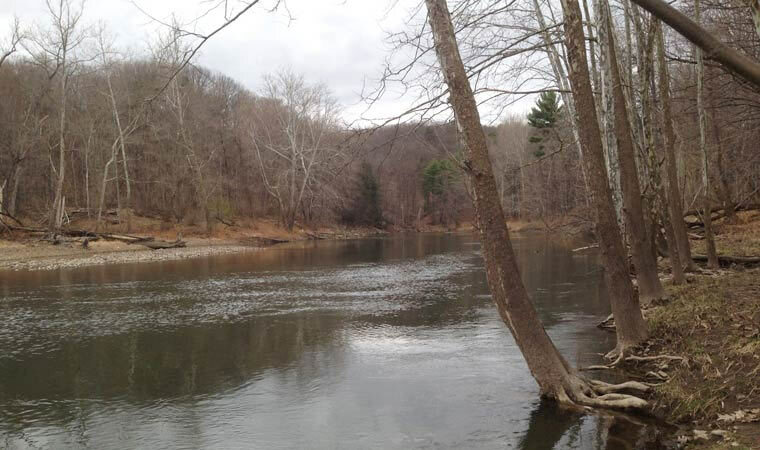 Scenic Hudson’s acquisition of the 144-acre property—located on Snake Road approximately 0.7 mile from the intersection with Jefferson Heights Road—in 2016 was another victory in the organization’s campaign to Save the Land That Matters Most. Since then the Greene Land Trust has played a leading role in preparing the land for public use. Located just upstream of the Village of Catskill, the property is at the confluence of Catskill and Kaaterskill creeks and includes more than two miles of shoreline on Catskill Creek, a major Hudson River tributary. The name Mawignack is a Native American word meaning “the place where two rivers meet” and was the name of an Algonquian village on the flats along Catskill Creek in the 17th century. From the one-mile loop trail, preserve visitors pass through an open floodplain meadow and along a scenic section of the creek’s bank. Also to be enjoyed along the trail is a portion of the railbed of the historic Catskill Mountain Railway, which carried passengers between the Hudson River and mountaintop hostelries like the Catskill Mountain House. Throughout the year there will be many ways to enjoy the preserve, including mountain biking, trail running, snowshoeing and cross-country skiing as well as the low-key joy of picnicking. Considering its proximity to the village, the land is remarkably unspoiled, as evidenced by its similarity to 19th-century paintings of the site by Frederic Church and Thomas Cole. The property still features upland forested areas. “Protecting this beautiful and historic land along Catskill Creek provides many benefits to the community—in addition to the beautiful one-mile loop trail, the preserve will support the local tourism economy and help to safeguard homes and businesses in the village from the devastating flooding they experienced during past mega-storms. We’re delighted to partner with the Greene Land Trust to open the property for public access,” said Scenic Hudson Senior Vice President Steve Rosenberg. In addition to offering great potential for outdoor recreation—including walking, fishing and nature study—the land will support efforts by the Village of Catskill to carry out strategies outlined in a 2014 report drafted by the Catskill Waterfront Resiliency Task Force, initiated by Scenic Hudson and partners, to prepare for flooding and other climate-related impacts. Specifically, the report recommended a holistic approach for managing the Catskill Creek watershed to reduce flood risks. Were the newly protected property to be developed, landowners might harden and raise the shoreline to protect their investments, increasing the likelihood of flooding downstream. Scenic Hudson and Greene Land Trust work to protect land realizing that preserving land provides the cornerstone of a sustainable Hudson Valley economy. Tourism in the 10-county region sustains nearly 86,400 jobs. Annual tourism spending in Greene County is $158.4 million and supports nearly 3,100 jobs. Protected lands also help grow other parts of the economy. A study by the Trust for Public Land notes that executives looking to relocate or start firms rank quality of life—including an abundance of parks and open space—higher than housing, cost of living and good schools. The U.S. Forest Service calculated in 2011 that over a 50-year lifetime one tree provides $62,000 worth of air pollution control and recycles $37,500 worth of water. Green infrastructure and open space conservation are often the cheapest way to safeguard drinking water, clean the air and achieve other environmental goals. Forested lands control erosion, absorb carbon dioxide and other harmful greenhouse gasses, and help shelter our houses from heat and wind. Wetlands serve as wildlife habitat, absorb storm and flood water and reduce pollutant loads in watershed runoff. Protecting open space also offers myriad human health benefits. Trees sequester pollutants that contribute to asthma, lung cancer, and cardiovascular disease, while releasing oxygen. In addition to helping keep drinking water clean and avoid flooding, conserved land maintains biodiversity, which plays an important role in preventing diseases such as West Nile virus and Lyme disease.